These crispy fried zucchini pizza bites are super easy to make and are perfect party food for any occasion. Make these for a fun weekend nibble or as part of your party spread! Preheat the oven to 180°C/350F/gas mark 4. Arrange the flour, breadcrumbs and eggs into seperate dishes and add a pinch of salt to each of them. Slice the zucchini into rounds about 1/4 inch thick and toss them in the flour, shake to remove any excess then dip the slices one by one in the egg and then roll in breadcrumbs until completely covered. Add around 1/4 inch of olive oil to a frying pan under a medium heat and fry the zucchini slices in batches until browned on each side. Set aside on kitchen paper for a minute. Add the oregano, passata and a pinch of salt and pepper to a bowl, mix together. 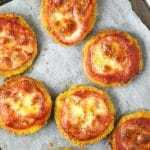 Place the zucchini slices on a lined baking tray and top each slice with equal amounts of passata and then mozzarella. Bake in the oven for around 15 minutes until the mozzarella is bubbling and melted. Serve warm.